Noida, a city of greens and a major IT hub of Uttar Pradesh. This city is really vibrant in its own manner and with the sky-rocketing scale of commercialization, it has also developed a fast and dynamic culture. These days people in Noida hardly have time to look beneath the skin and it’s time to bring little rest, peace and love to the daily mundane lives of the people of Noida. Keeping this particular as a first priority, MyFlowerTree allows the people of Noida to choose from the huge collection of flowers and gifts from their store and send combo gifts delivery in Noida online from the comfort of their home. Always remember one thing that love is the most special bond and it makes feel happy, content and filled from the inside. If you are in a long distance relationship and your beloved one resides in Noida, don’t let the distance to kill the love that you have for your dear one. MyFlowerTree comes here as a big rescue for you. You can easily opt for the combo gifts delivery in Noida even if the address of the recipient is located in the remotest corner of this city. The same day and midnight gift delivery offered by this online store are some of the exclusive delivery service offered by this online store. 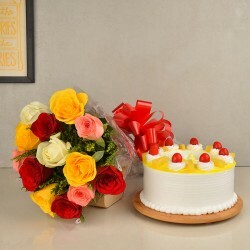 If you want to express your hearty love and affection to your dearest person, you can simply go for cake and flower delivery Noida with the midnight delivery feature offered by this online store.